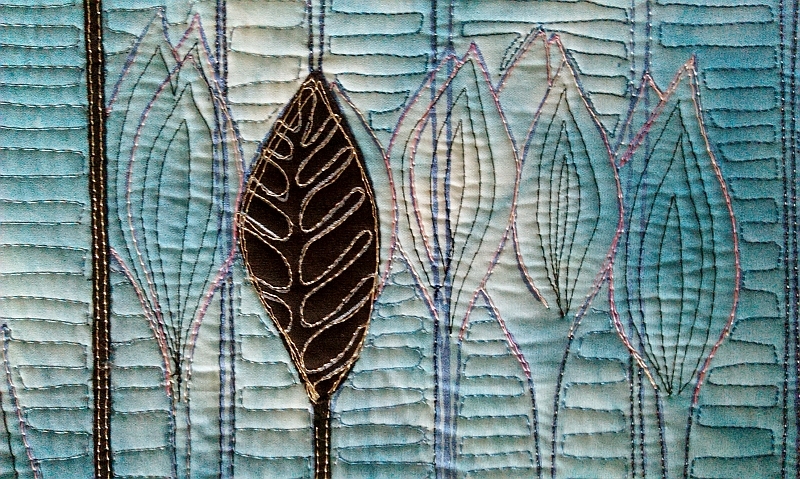 I have to admit that this is not one of my favourite quilts so far. It is a piece, I started last summer at a day school with Edwina McKinnon, which focused on screen printing using screen printing inks. The original piece was much larger than 15 x 15” and had two other contrasting fabrics and once back home was relegated to one of my very full cupboards for working on some time later, much, much later. When the ‘nature’ theme was announced I remembered my screen printed tulips and as is often the case, when you revisit a piece of work much later, it can sometimes be quite appealing. I still didn’t like the colour combinations and so I got rid of them and it immediately took on a much more sophisticated look. However, once I started the quilting, I realised that continuous machining was impossible and so I gradually did part of the stitching and then spent the evening stitching in all the ends, using this method over a few days – lesson learned. Hence why it is not my favourite quilt, as I found the quilting tedious, rather than my usual feeling of enjoyment when quilting. So, a very ‘uncolourful’ piece of work for me really, and I may try something similar again, but add an accent colour. Your quilt is beautiful ,the design is no doubt very sophisticated ,but I love the one in the close up even more ,seems to have a sort of a perspective to it which is speaking to me . Margaret, you might find it “uncolourful”, but I very much like the simplicity of this piece, which is evidenced in the patterning (repeated pattern) and the stitching (however monotonous!). 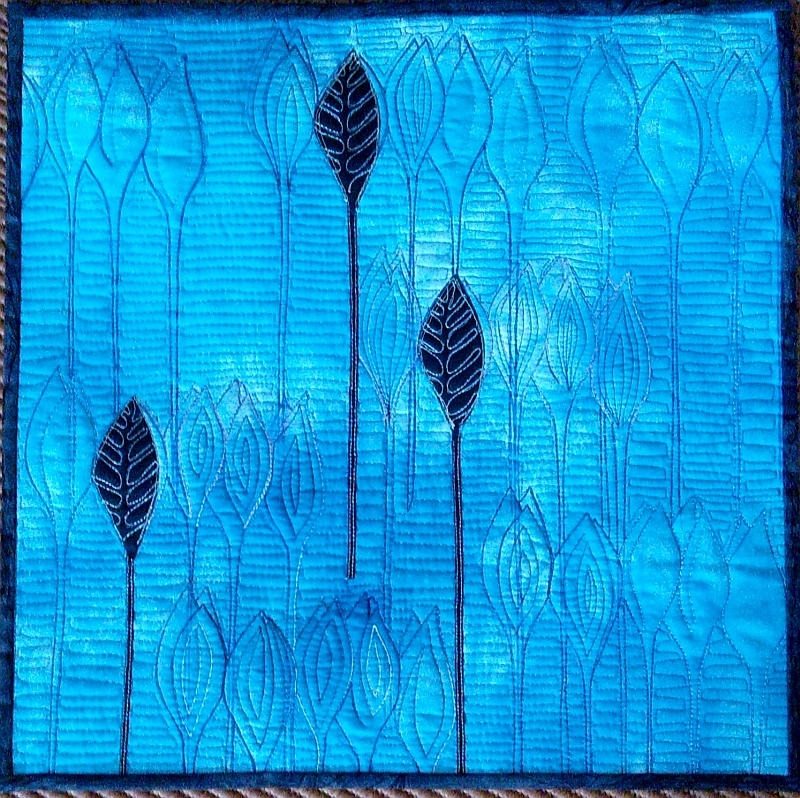 It’s a great abstract of a floral motif — whether tulips or some other sort of seed head…and the blue-on-blue is very soothing and peaceful. I like it a great deal! This was the first one in the group that struck me as appealing. Since I am a basically abstract artist who uses lots of nature motifs and influence in my work I guess I liked the way it is suggestive of nature with wonderful form and line. If the detail image is more representative of the actual color of the piece, I really love it!